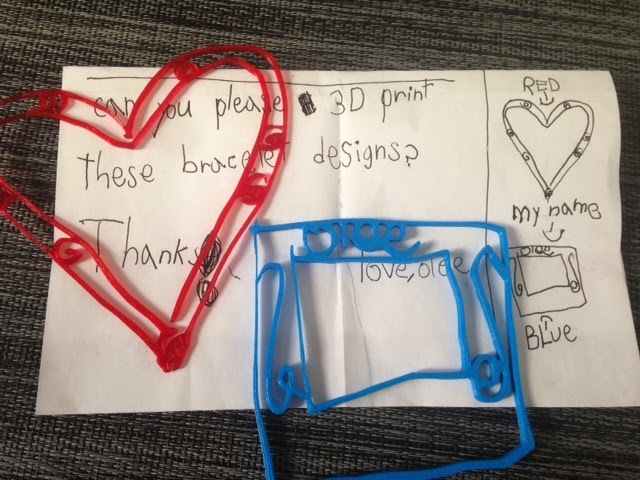 Today we printed some custom bracelets for my niece, who mailed us a very nice letter that included some awesome designs to start from. Her designs were so good that we decided to print them exactly as she drew them! We tried to size them correctly but if they don't fit then they can be used as picture frames or room decorations. Technical notes: We used the photo --> Inkscape --> bitmap --> SVG --> Tinkercad chain to make this, just like in Day 109.